What better way to mark the start of spring that with a little jaunt down to Cardiff bay for the 10k. Having heard about this fast, flat course this year i wanted to give it a go to shake my legs out after doing lots of long distance marathon. Got down there early only to be stuck in all the traffic trying to park. This would probably be one of the worst things about the race, so if you do intend on doing this race next year please allow plenty of time. After not getting time for a proper warm up i jumped straight into my pen to realise i had forgot my watch, i guess this race would be done on feel. Fortunately my training partner Matt James was there and if i could keep up with him i would put in a good time. It was a fairly cramped start and took about a mile before you could really settle down into a rhythm, but you soon found yourself running in a pack at what i hoped was a good pace as the route meandered out along the bay. The route was definitely pan flat the biggest elevation was jumping the curbs to get around some of the runners. It was a little twisty with 2 hairpin turnaround points. There was also a fair amount of wind out by the bay as you would expect but nothing compared to Rhayader which is now the new benchmark, but with so many runners around and a staked field it was easy to find shelter and use them to slipstream, before you ended up back in the main bay area with all crowds cheering you on to finish in front of the secret torchwood entrance. I managed to see a few Wye Valley Runners names down. Some very times by all there, definitely a race ill be doing again next year. After last years cancellation due to the beast from the east, i wanted to give this race a try again this year. The first year it has been held under new organisation, this half marathon started at 10:15 am on the seafront in beautiful sunshine which was in complete contrast to last year. The first thing to say was that the organisation was top notch. There was timed areas for everyone to start in, these unfortunately were not enforced and as the race gets bigger this is something they may need to look into. There also looked like there may have been a shortage in toilets but having a hotel room 300 metres from the start line didnt affect me either. The race started on time and led us around a little 2 mile loop to bring us back to the start which was obviously a way of making up the distance. After this it led us onto the beach for 3/4 of a mile, which is great on holiday but not when you are chasing a time, we then proceeded out of Weston heading up away from the coastline slightly which had a series of sharpish climbs before looping back round to do another 3/4 of a mile on the beach to take us back on to the Weston promenade back to where we started completing a 7 mile loop before heading the other way up the sea front. We got some fantastic support for the 2-3 miles along the sea front before tackling a climb heading out, keeping that in the back of my mind knowing that at the end of this loop it would be a fast downhill finish back into the promenade before finishing on the Weston pier, and they even removed the turn styles for us. I asked about the bit on the beach and they said that was only because of road works which will make this a quicker course. Overall i enjoyed my race, i ran a 1:18;23 finishing 6th, i know there is quicker courses out there but not many offer fish and chips on the beach afterwards. After the unseasonably warm and sunny weather of the previous week, winter returned to greet the 12 strong contingent of Wye Valley Runners, who were in Rhayader on the 2nd March to take part in the Round the Lakes races. There were two distances on offer; 30km and 5 miles, with 10 WVR completing the long race and 2 the shorter version. Our two 5 mile racers were Jan Edwards and Brian Symonds who were bussed out, along with 146 others, to the start on the shores of the Garreg-Ddu reservoir in the Elan Valley. On paper the race looks to take in a fast, largely downhill route back to Rhayader but with a few nasty little hills in the last few miles, coupled with the wind and rain it was to be a tough race. First home was Jan in 39:21 and Brian close behind in 40:34, both of them finishing first in their categories and well up the field overall. The remaining 10 Wye Valley contingent set off at just after 13:00 for the full 30km loop in a field of over 500 runners, starting and finishing in Rhayader. After a fast largely downhill tour of the town the race headed off up the 4 mile climb over the Penrhiw-wen pass and into the 40mph winds that were the stand out feature of the day’s race. With the big first climb completed the route takes a largely downhill course along the Elan valley and looked to be a fast section of the race. The strong headwind had other ideas! At the front end of the race, which was more spread out, Steve Flowers had to battle through the headwind on his own, but further back, the field split into distinct groups of runners working together to take it in turns to take the brunt of the wind and to shelter behind each other. I don’t think I’ve ever experienced quite such a profound slip streaming effect while running before. I’d be on someone’s shoulder thinking that they were going too slow, I’d move out to overtake and almost get stopped dead by the wind. After about 13 miles the course dropped further into the Elan valley and the wind eased a little for the last 5 miles into town. First home for WVR was Steven Flowers in 8th place overall in 2 hours 5 minutes. 20 minutes later and in quick succession, came David O’Brien, Ward Linney and Laura Tootell, separated by less than 2 minutes, with Laura taking first place in her category. Another trio of WVR, this time within 30 seconds of each other, were Clare Sims, Paul Kemp and Nick Preece at around the 2 hour 37 mark, then followed Maria Miles, Anthony Evans and Ann Pritchard. 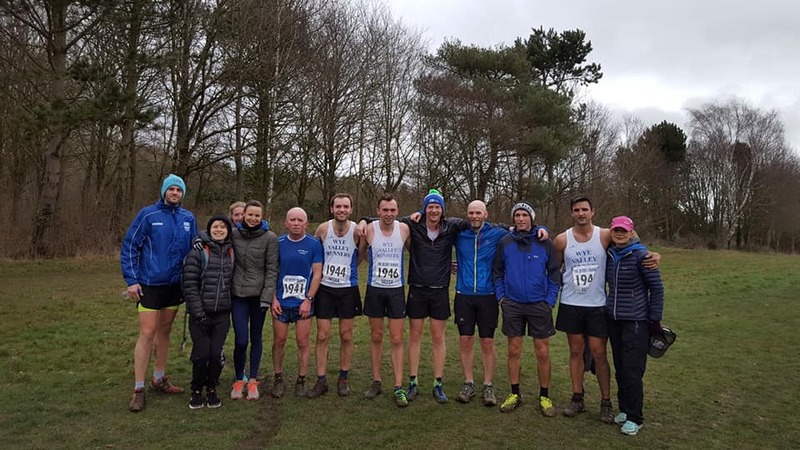 Great running by all in what proved to be very tough conditions on an interesting and scenic course, and big congratulations to Jan, Brian and Laura for winning their respective races. Thirteen intrepid WVRs (9 lads and 4 ladies) made their way to Leamington last Saturday to take part in a classic event, the Midland Counties cross country championships. It is more years than I can remember since we had a mens and ladies team taking part in this high class competition. Drama over, the other runners started to arrive and the ladies got ready for their race. The course was fairly straightforward, being 2 laps of the common and adjacent redundant golf course. The addition of the golf course made for a much more interesting course than I remember at this location ( 20 years ago! ), with the undulations making for a challenging but fast course of around 8k in length. On the first lap, Laura had made a steady start and was soon followed by Jodie, who always finishes strongly in cross country races, Jane was not far behind, with Cath completing the team just behind her. On the second lap, Laura began to tire, but still held her position well to come home in 57th place, with Jodie catching every step of the way down the finishing straight, only one place back. Jane was next in 122nd and Cath followed in 136th. The standard at the sharp end was very high, with first runner home under 30 minutes, but all of our ladies ran really well, all achieving very respectable finishes in a field of 263. A special mention for Cath Watkins, who stepped in at the last minute to make sure that we had a team, resulting in a 12th place out of 33 complete teams. For a club of our size, this was a truly outstanding performance, which put many bigger clubs to shame. Well done girls! About an hour later, it was the lads turn. Three laps and 12k this time. Also the largest field of the day with over 400 starters. On the first lap, Steven was first WVR and then a gap to Peter Nugent and Richard running together. Lea wasn’t far behind and Peter Flynn, running strongly came next. A smiling and relaxed David Klotz was 6th counter, backed up by consistent Ward Linney, then Boosty and Lewis, running, I believe, only his second cross country for the club. Positions were unchanged on the second lap, with Steven looking strong and Richard tracking Peter Nugent, every step of the way. Lea was beginning to suffer, with Peter Flynn impassive and gaining ground. Dave, still smiling was still the last counter for the team. Only Boosty looked like he really wasn’t enjoying the day! As the ladies gathered at the finish to cheer the lads in, we were just in time to see the winner sprint home, comfortably clear, in an incredible 38.20. First home was, as expected Steven in 104th place, having a much better run compared with his recent performances. Some 2 minutes later, Peter appeared down the finishing straight, but was passed by Richard, who had followed him for almost the whole race. Nice one Rich! Peter, you need to work on your sprint finish! There was a little wait before Peter Flynn arrived, having passed Lea in the finishing straight. Only 1 second separated these two. We didn’t have to wait too long for Dave to close in the team. Ward was close behind, looking like he could do at least another two laps! Coming in just over the hour mark was a very tired looking Boosty, with Lewis, still running strongly, only about 100m behind. The mens team also did exceptionally well, finishing 18th out of 33 complete team. It is worth noting that one of our larger neighbours, Cheltenham Harriers, could not field a complete team, so this was all the more impressive by our boys. I have been to many of these championships as a competitor, but have never enjoyed one more than this and it was a privilege to be chauffeur and support to such a great bunch of athletes. This augurs very well for the future of Wye Valley Runners as a truly competitive running club. 4 teams next year? Ladies Team (L to R) - Laura Tootell, Jodie Newell, Cath Watkins (hiding) and Jane Hayde. Also Naomi Prosser - WVR for the day! 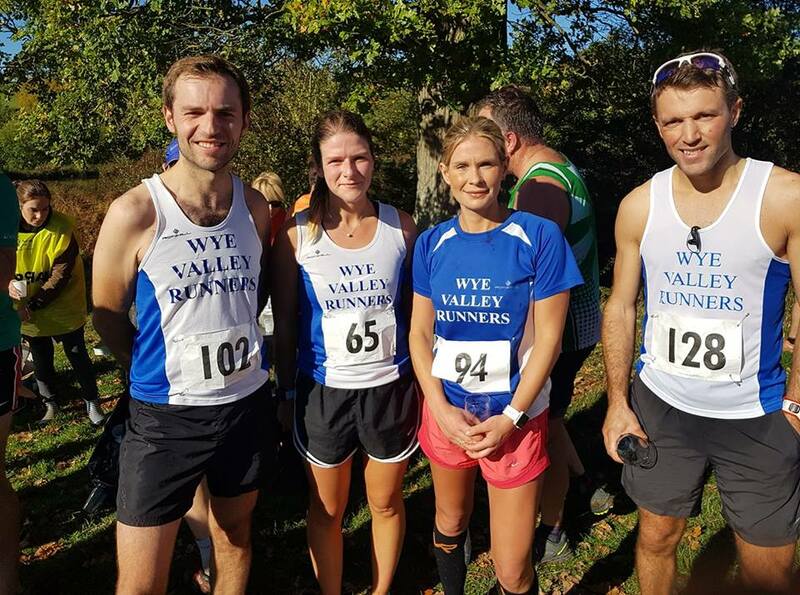 A large contingent of Wye Valley Runners crossed the border at the weekend to race in the Welsh hills. A 12 strong team headed to Rhayader to take part in the Elan Valley 10 mile race. It's a tough, undulating course on quiet country lanes and the runners efforts were rewarded by the stunning scenery. The sun even made an appearance on the drive there, and stayed for the day. 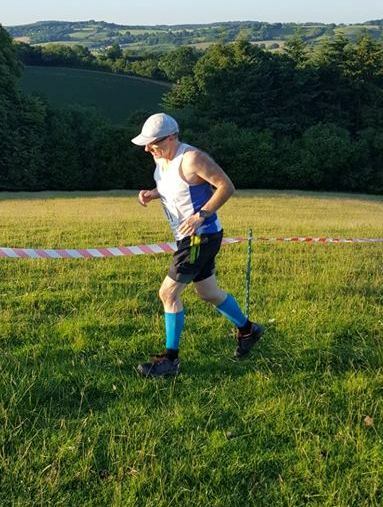 Richard Williams continues to have a strong first year as a Wye Valley Runner finishing in an impressive 5th place overall. Next across the line for the club was Ryan Chidlow then Tony Champkin, Lara Seal, James Vidler, Lynne Compton, Malcolm Edwards, Emily Davies, Brian Symonds, Becky Humphries, Sian Champkin and Robert Vidler. Jan Edwards was also in attendance as chief supporter and principal photographer. A good turn out and some great results at a race that comes highly recommended by those that attended, so it looks like we might need to hire a bus next year. Meanwhile, further south in the Brecon Beacons, I was taking part in the Beacons Ultra. This is a 46 mile race starting and finishing in Talybont on Usk and takes in 2 laps of the Beacons. Simon Oliver was supposed to be joining me for this one but unfortunately injury prevented him from doing this one. 46 miles isn't the sort of distance to attempt while injured, so he made the wise choice and hopefully will be back fitter and stronger for next year's event. The loop covers a mixture of terrain including canal path, forest track, open fell side and the roman road pass over the mountains. The long climb up Tor y Foel proved to be the toughest section, especially on the 2nd lap when I had 27 miles in my legs. I have to admit that it broke me a bit, but I managed to keep plodding on and eventually found my 2nd wind. I was again beginning to flag at the 40 mile mark but the long descent from the top of the roman road and a large lump of cake (Ultras are basically picnics with a bit of running thrown in!) at the final checkpoint was enough to get my legs turning over at a more respectable pace all the way to the finish. I finished in 8 hours 49, a few minutes slower than the year before, but nicely within the 9 hour target I set myself, pretty much running from sunrise to sunset on what turned out, after a misty start, to be a stunning sunny autumn day. This is a well run event that gets bigger every year, attracts a strong field and is also suitable for those attempting their first ultramarathon. For those that think that 46 miles is a silly distance to run, there is also a marathon distance race on offer over similar terrain. 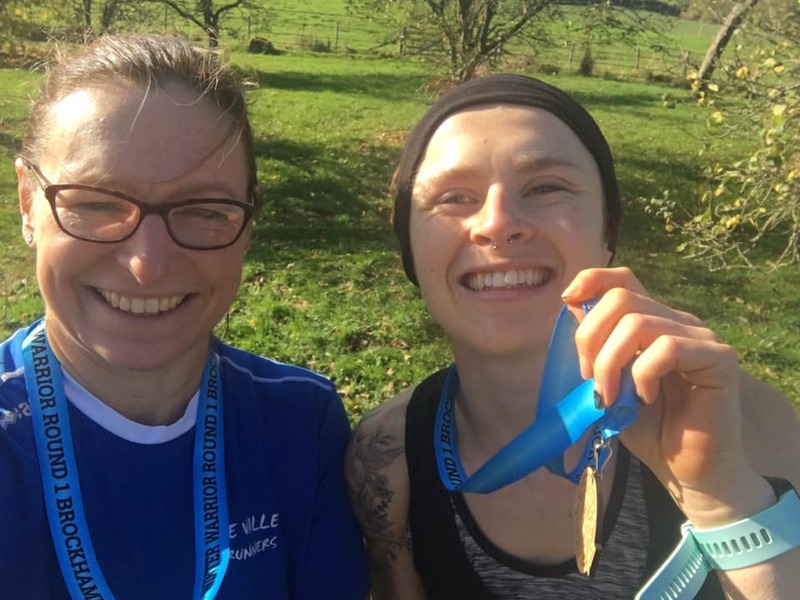 It was a very fresh Sunday morning where 2 Wye Valley Runners joined in the second biggest marathon in the UK and Ireland with over 20000 participants. To say it was fresh might be an understatement as experienced runners were wearing there free hats and keeping on extra layers right up until the last second when cheap discard able layers would be thrown to the side where spectators look like they are under attack. For me i could only find one problem with this marathon, the start was complete chaos. They split the race downs into waves but after that it was a free for all. You had 5000 runners in a free for all and not joining the start line in respective to the pace they want to run, which even lead to some runners running outside the course trying to find space and then attempting to jump a hedge once they realised there mistake. After a couple of miles the race settled down and it led you out of the town through an massive park with long straight roads which cut straight through. Even in this remote part of the race the support was fantastic with crowds lining the streets almost the entire 26.2 miles. I wouldnt say its the most scenic if routes as this stayed fairly residential but the walls of noise was better motivation than a breathtaking backdrop. This is the flattest marathon i have with a 700 feet of climbing, but none of these were severe climbs and if you tackled the hills properly and relaxed coming down the other side they barely even registered as an inconvenience. The last 5k felt like you were running into a headwind, which may been the effect of running over 23 miles or an actual headwind, but at this point you just hit a wall of noise and were spurred on by the shouting, giving every last bit of effort and leaving it all out there. I was delighted to get my times back on track and after a poor start i ran 2:49:04 and finished 236th, Cath managed to keep her times tumbling with another pb 3:40:11. My overall verdict would be if you cant get in London this is a great 2nd choice, it might lack the iconic sights of London but the atmosphere and goody bags start to make amends capped of by copious amounts of Guiness make it a no brainer for your diaries. 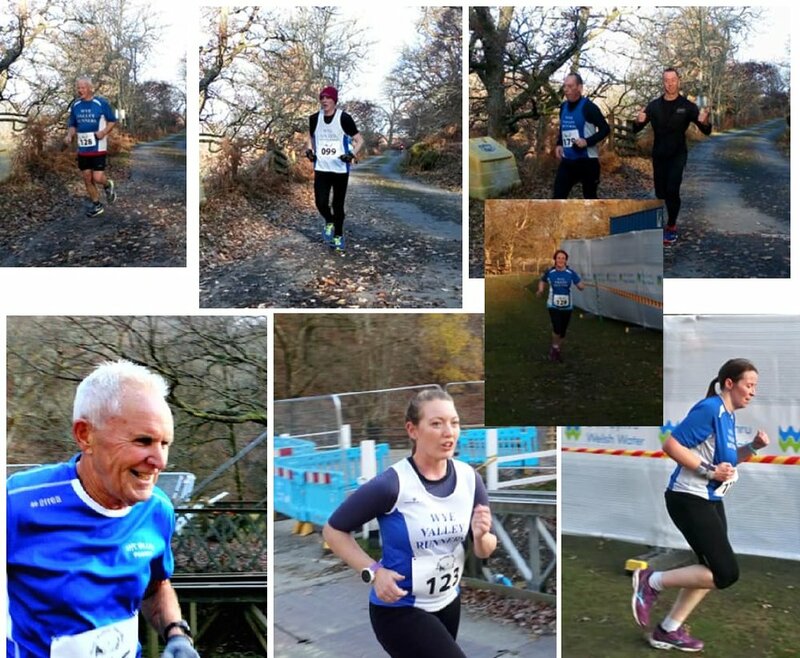 Wye Valley Runners at Eastnor Magnificent 7! As you can see by my beetroot face - it was tough! Beautiful views on a lovely sunny day. The course was flooded the night before the race, they had to change the course over night as parts of the course were under water. The new course was very undulating but very scenic along the shores of Loch Rannoch. It was a lovely Sunny ☀️ cool day which made perfect running conditions. Tony finishing in 1hr 38mins also getting this years best time. Its the second biggest half marathon after the Great North Run.The weather was cool at first but the sun emerged and it was perfect conditions.There were big crowds all the way round and a fantastic atmosphere. We had a good Wye Valley turnout but it was tricky getting everyone together for photos.Our first boy home was Steve Flowers, with Peter Nugent not too far behind and Paul Davies (AKA Dad) was 3rd! Clare Sims was our first girl across the line and Cath Watkins next,with Lucy Mason close on her heels, first time at Cardiff for Lucy. Brian Symonds won his age category again, by a very wide margin. Thanks to Jason Smith for his support on the day and the Nugent family too.Good to see Lucy Smith competing again ! Tony & Siân ran the Cheltenham Half Marathon, on a cool bright day starting and finishing at the racecourse. The race was well supported by the locals all the way round. Tony finished in 1:39:01 obtaining an Elite time for the over 60s Which Qualifies for a free place next year. Jane Hayde & I drove the long journey up to Lake Vyrnwy on the 9th Sept to do the half marathon. We were persuaded to do this one on account of it being flat, unlike most of our local races! After completing the Worcester half back in May in the boiling hot sunshine, I was hoping for better weather conditions as the heat slowed me down & I didn't achieve the time the time I wanted. We left Hereford in the sunshine & as we drove nearer, the clouds built & much to our delight it began raining! I personally thoroughly enjoyed the flat course & for once, not having to dread what kind of incline was potentially waiting around the corner! I'm sure the view of the Lake was gorgeous if you could see it through the cloud & drizzle! It was well organised & well supported & you were given a t shirt & a medal at the end. I would recommend it to anyone in pursuit of a PB, if you don't mind the travelling. I was thrilled to have achieved a PB of 1 hour 37 mins, knocking a minute off my previous time 2 years ago! On 16th September 200 runners assembled in Kinlochleven to race the Salomon Glen Coe Skyline. The field comprised some of the best mountain runners from around the world, including Killian Journet, fresh from winning his World Skyrunning title the day before. The field also included two Wye Valley Runners, Dan Lewis and myself (Ward Linney) who had spent a good chunk of the summer running up and down the biggest hills we could find, to prepare for what would be 21 miles of mountainous terrain, including 9000 feet of ascent and sections of moderate rock climbing all thrown into the mix. As we stood in the start pen, slightly awed by the company, the rain lashed down and the wind howled to properly introduce us to the Scottish Highland weather. A lone piper belted out Flower of Scotland to add to the already buzzing atmosphere, the starting hooter was sounded and we were off. The first 6 miles were relatively straight forward as they followed the large West Highland Way path and they lead us to the most difficult section of the race. Curved Ridge, a grade 3 scramble or moderate rock climb, which took us from the base of Glen Coe to the high point of the day on the summit of Buachaille Etive Mor at 1022 meters. We then had to battle our way through the 50-60 mph winds that were whipping over the summits for a couple of miles before dropping back down to the relative shelter of the valley. We didn’t stay low for long though as after wading through the river there was another steep climb up the 2nd mountain of the day, the 925 meter peak of Buachaille Etive Beag. This time up slippery, muddy terrain rather than rock. Dan was well ahead of me by this point and Killian had already finished!! The next valley crossing included a feed station so the final climb of the day was well fuelled by cheese sandwiches though no less painful on my now cramping legs. The Herefordshire winter cross country league prepared us well for the final descent as it included a couple of miles along a wet, muddy and very slippery ridge before getting back onto the West Highland Way path and a fast few miles back to the finish. Dan was the first Wye Valley Runner home in 05:34:05 and I came in at 06:38:49. We were both happy with our races and glad to be a part of an amazing international event. To show you what we were up against, Killian Journet won overall with a time of 03:37:15. Incredible! A select few WVRs ventured over to Worcester to take on this City centre race which is rapidly gaining in popularity. First to finish was Rob Gilligan in 45.51, with Lynne Compton following in 48.23. Becky Humphries completed the WVR results in 51.14. There is also a half marathon as part of the days racing, but I couldn't see any WVR finishers. There was a day when so many Wye Valley Runners wanted to run this famous race that we used to hire a coach. Only 2 of our lads braved it this year and to be honest, looking at the results, the race does seem to have lost it's gloss, with only one runner getting under the 30 minute mark. Steven Flowers was first home, running 36.43, not a PB, but as he is building up his mileage for the Dublin marathon in October, a pretty good effort nonetheless. This was good enough for 45th place overall. 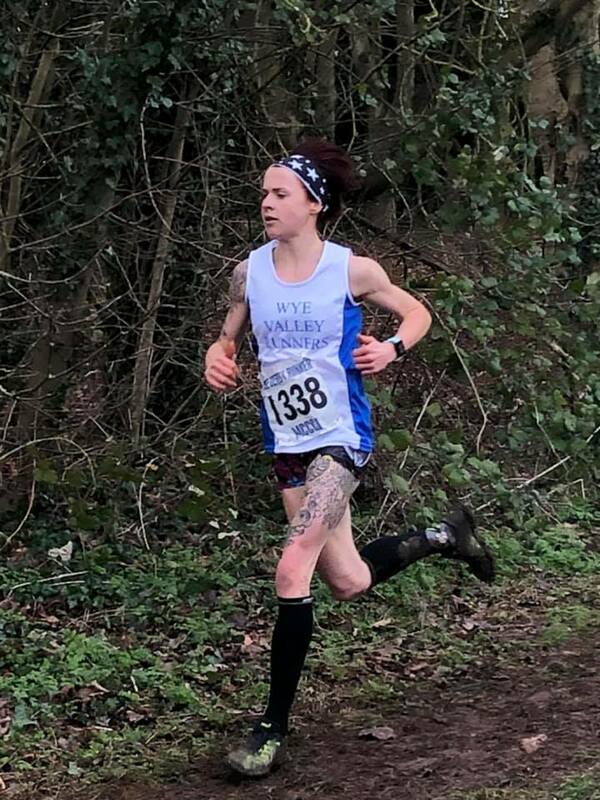 Lea Wood, who has been looking good in training, achieved a PB with 38.13 and is rounding into form nicely for the Cardiff half marathon in a few weeks. First back in 10th place was Richard Williams in 41.13. Tony Champken (now sponsored by Swan brewery) was next in a very creditable 46.48. Tony was 19th and first M60. Not far behind in 21st place came Brent Lowson in 48.08, believed to be a PB. Jan Edwards was next in 53.38 and first lady over 60. Sian Champken was comfortably under the hour in 58.06, but Bryan Symonds seemed to be taking it easy in 62.38, securing another M70 prize. This is a small but very enjoyable race (which I have watched!). Lets have a few more WVRs next year if it doesn't clash with other races. A special mention to Barry Reynolds from our neighbours Hereford Couriers, who for once didn't finish second and came home to win the race, as well as obviously being first M45. Well done Barry! Didn’t we have a lovely day, the day we went to Barry! A beautiful day, we had sun all the way and all for £20 you know. This was the inaugural running of the Barry Island 10k and it didn’t disappoint. The organisation from start to finish was spot on. Car parking was plentiful, the bag drop and collect experience was faultless, the start pens were easy to access and not over-crowded and the whole event was managed extremely well by an army of organisers, marshals and volunteers. The route started and finished on the road above the promenade and along the way took in views around the docks , the grand building of the Vale of Glamorgan Council, Romilly Park, the Marine Lake and old Knap Swimming Pool and the harbour . The course was ‘lumpy’ to say the least - incorporating short, sharp climbs and some longer steady ones; but with every up there was a down (as well as some welcome flatter sections too). Once over the finish line, runners received a finishers t-shirt and medal (and quite possibly a touch of sun burn) for their efforts. Then after reuniting with families, friends and fellow club runners, many participants took to the sea for a paddle or a swim to soothe those tired muscles. Whilst Wye Valley Runners were happy to paddle, there were only two who actually braved the swim!! Well done to Brian, Lynne, Becky, Rob and Amy who represented Wye Valley Runners on a very hot, sunny day in Barry. Thank you to Jan (who didn’t run, due to a calf niggle) who was there to support and shout encouragement. Saturday evening when most people are knocking back a few cold beverages 3 of us put our evening to a more productive use with a little trip out Ludlow Castle where we ended up participating in a 10k race which can only be described as not flat. This is the 2nd year this race has taken place and the first time it was a 10k race after last years slight mix up which meant we got an extra 2k free of charge, they definitely got closer to the money this time round. Many of you who have taken part in the Storm the Castle duathlon will be familiar with this route. This is a 2 lap course on closed roads starting at Ludlow Castle, you head off at a gallop through the high street as the locals come staggering out of there local watering holes to see what all the fuss is about before joining in the vigorous cheering, you then head out on the quickest part of the course thinking you could be on for a pb here before you remember you are in Ludlow. After a rolling climbs about 1.5 miles you are met with an off road section aptly called the lactic ladder, which are like mini croc 8 steps to take you up around the woods with a few technical to test the road runners who switch off and don't look where there going, you end up coming out at about the same place to then head straight into yet another climb called "the wall" which is one of the steep hills back into Ludlow town where you finish your first lap just in time for the locals to have replenished there refreshments and cheer you on your way for the second lap to repeat it all over again. The race picked up a bad reputation last year for getting the distance wrong, but this is still a great race. There is a fantastic atmosphere around the town with brilliant local support. You are never going to set a quick time here but that doesn't detract away from the enjoyment of the occasion. Cath Watkins Siân & Tony Champken ran the Bath Two Tunnels Races. 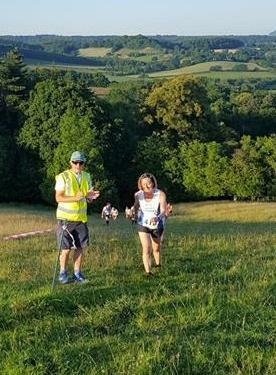 On a very hot day Cath ran the 10K in 48 mins & Siân & Tony ran the Half Marathon ( 2-08 & 1-51 ) completing the medal set and both collecting the engraved glass challenge Trophy. It was lovely and Cool in the Tunnels but it was like going into an Oven when you came out. This is a very well organised & friendly event. We highly recommend it for next year. 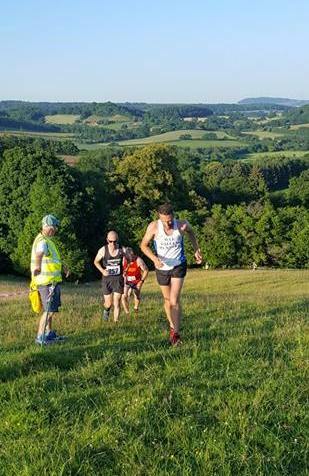 The second race in the Herefordshire Summer Cross Country, hosted by WVR, took place on a glorious but very hot evening. 123 runners, including 25 Wye Valley Runners, found their way to Mervs farm, where the race started. After the initial stampede across the fields, the competitors were soon into their running and beginning the descent towards the brook. This is a tough course with many hills along the way, after the fairly gentle start and a couple of stings in the tail after re-entering the field towards the finish. John Pugh from Builth was the first to appear at the end of the 5.1 mile route, with Matt James from the Couriers a little way behind. A close race for third was won by our own Sam Mayglothling - the first back for WVR. Ably backed up by Steven Flowers (9th), Dan Lewis (11th) and Jeremy Jehan (13th), it was looking like Ludlow would not repeat their performance at High Vinnals. Three more WVR men, recent recruit Richard Williams, Peter Nugent and Lea Wood were also in the first 20 finishers. We needed another good performance from our ladies and they did not fail to deliver. Laura Tootell was third lady overall, continuing her fine run of form and first WVR lady in 37th. Not far behind Becky Davies just held off Becki Ansfield to record 55th and 56th respectively. 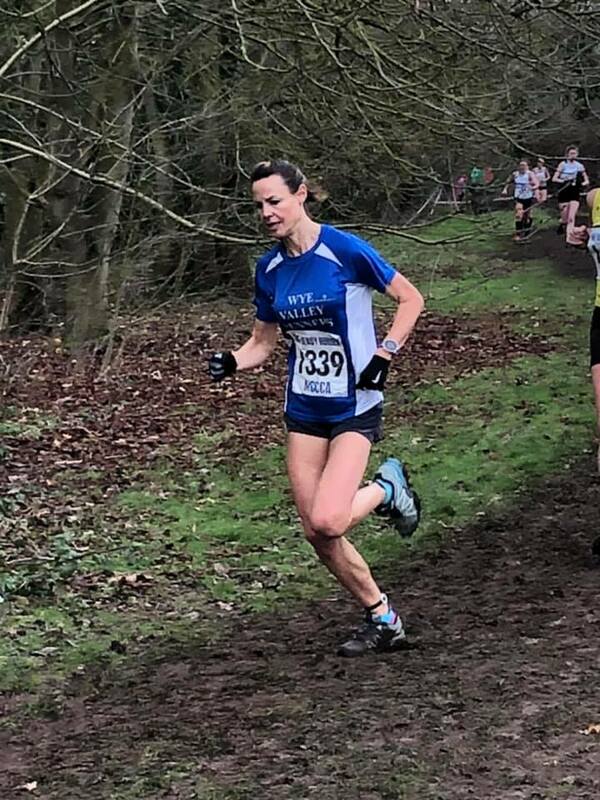 Lucy Mason had a good run to finish not far behind in 67th and we are beginning to get some real depth in our ladies team again. In the end it was a comfortable win for WVR on the night, form Monross Trailblazers and Croft Ambrey with Ludlow relegated to 4th this time. We are also leading overall after 2 races, 4 points ahead of Ludlow. Our B team is also lying joint 5th, so fantastic performances all round. All to play for at Westhope on Wednesday 11th July. If I'm not there to cheer you on, it will be because I am watching England get to the World Cup Final!